THE USP GRADE refers to the Castor Oil prepared in conformity with the United States Pharmacopoeia norms. Pharmaceutical Grade Castor Oil is produced by first pressing of Castor seed, without losing medicinal qualities. This Oil is widely used in Pharmaceutical and Cosmetics. THE PH. EUR GRADE refers to the Castor Oil specifications as laid down by the European Pharmacopoeia Standards and the DAB-10 German Pharmacopoeia. THE BP GRADE refers to the Castor Oil prepared in conformity with the British Pharmacopoeia norms. 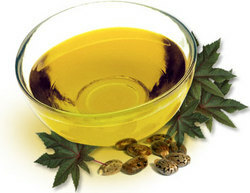 Pharmaceutical Grade Castor Oil is produced by first pressing of Castor seed, without losing medicinal qualities. It is a clear, colourless or slight yellow viscous liquid. This Oil is widely used in Pharmaceutical Applications.